These 11/0 seed beads are from the Czech Republic and are round (similar to a donut shape with a hole in the middle) , measuring approx 1mm x 2mm. 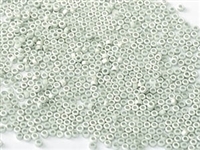 These beads work well alone, or mixed with other beads and crystals. Czech seed beads come in a variety of colors, some very unique and limited to items from the Czech Republic. Live the beads and as always shipping was very fast.